While global netizens have not yet stopped drooling over the pictures of Deepika-Ranveer wedding, the Internet is all set to break down over the most-awaited Priyanka Chopra-Nick Jonas wedding next week. Everything from the engagement diamond ring worth INR 2.1 crore to the invitation card to the wedding venue makes it a big fat Indian wedding. Nick Jonas, along with his parents and siblings landed in India yesterday. Then they had a fabulous Thanksgiving dinner in Delhi where would-be-bride Priyanka is busy shooting for acclaimed filmmaker Shonali Bose’s The Sky is Pink. Though the total cost of the #nickyanka wedding extravaganza is not known, everything about the event is so regal and exclusive that our readers are waiting for the D-day with a bated breath. We at Travel Beats, a leading overseas Indian community portal by Indian Eagle Travel, curated the details of the upcoming Priyanka Chopra-Nick Jonas wedding much to your pleasure. Since Quantico actress Priyanka will tie the knot with Nick in an Indian Hindu wedding, the D-Day will be preceded and accompanied by a myriad of traditional rituals as well as ceremonies. The Priyanka Chopra-Nick Jonas wedding schedule is chock-a-block with pre-wedding celebrations which will commence with the mehendi and sangeet ceremony on November 29. The next day is reserved for a cocktail party for guests from Hollywood and Bollywood. The Haldi ceremony will take place on December 1. The wedding will be solemnized through Hindu rituals on December 2. The couple will exchange wedding vows in the Christian fashion too, the next day. Reportedly, the post-wedding celebrations include two receptions: one in Mumbai and the other in Delhi. Needless to say, the sangeet ceremony of Priyanka Chopra’s big fat Indian wedding is expected to set fire to the stage over electrifying performances by both the groom and the bride. While Priyanka will perform to some of the most popular numbers in her films, Nick Jonas will dance to a medley of his fiancée’s favorite songs. If the grapevines are to be believed, the sangeet ceremony will be held at the historical Mehrangarh Fort of Jodhpur. The Priyanka Chopra-Nick Jonas wedding is a 5-day grand affair at the Taj Umaid Bhawan Palace in Jodhpur, Rajasthan. One of the most luxurious wedding venues in Asia, the Umaid Bhawan Palace is home to the former royal family of Jodhpur, a heritage 5-star hotel and a museum. Sprawling across 26 acres of land, the colossal sandstone edifice is perched on Chittar Hill, the highest vantage point of the city. 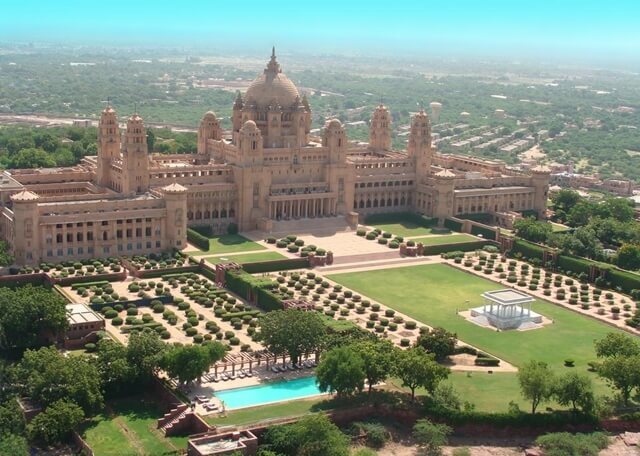 A short flight away from New Delhi IGI Airport, the Priyanka Chopra-Nick Jonas wedding venue in Jodhpur has 22 rooms, 42 suites, grand banquet halls, ballrooms, a massive library, an indoor swimming pool, a throne chamber, four tennis courts, and helipads. Built to create employment for the poor working class during a one-year famine in the pre-independence era, the palace exudes oodles of magnificence in its every nook and corner. The Priyanka Chopra wedding venue costs per day are not yet revealed. But, it’s not difficult to guess the expenses since one night in any of the 22 rooms at the palace hotel costs INR 34,000. The presidential one-bedroom suite costs a whopping INR 500,000 in the thick of tourism season from the beginning of December to the end of January. 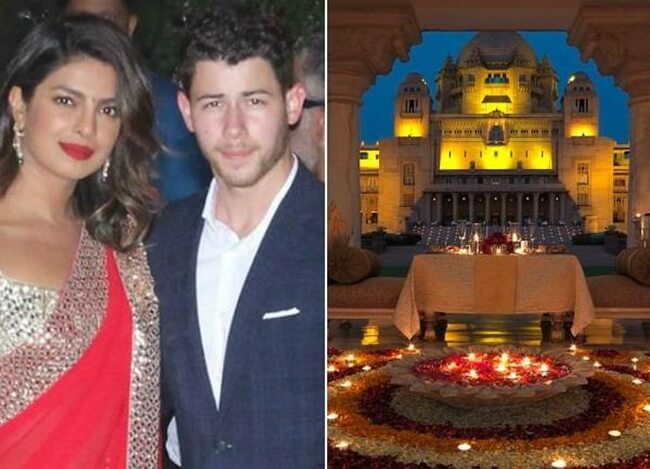 Reportedly, INR 43 lakhs ($60,000) are being charged for each day of the Priyanka Chopra-Nick Jonas wedding at the Umaid Bhawan Palace. Jodhpur is a most popular tourist destination in India. The Blue City is well-connected with the capital city, Jaipur by air and road. The #nickyanka wedding is being speculated as a study on influencer marketing and branding. The couple has struck endorsement deals with some premium luxury brands ahead of their D-day. She has picked up her wedding shoes from Jimmy Choo in Paris. Though the names behind Priyanka’s wedding wardrobe are not yet revealed. Her headlines-making appearance at the Oscars, the Emmy Awards, the bridal shower in New York and the bachelorette party in Amsterdam makes her fans be sure that Priyanka’s wedding outfits will turn heads on far and near. Notably, she has a penchant for white shades, feathery dresses, slim-fit gowns and fur accessories. Ralph Lauren who the Quantico actress put on for her ‘Met Gala’ look is a shout out on the A-list of designers for the couple’s Christian wedding. The #nickyanka wedding night and receptions won’t be as intimate as their engagement ceremonies and bachelor parties. As per sources, only 200 invites from among their close friends and family members are on the wedding guest list. The extended family members may turn up at the receptions in Delhi or Mumbai. However, who will add stars to the galaxy of the Priyanka-Nick wedding in Jodhpur, is being speculated. The couple’s close friends from the United States, including Game of Thorne’s Sophie Turner will be taking flights to India for the D-day. Lupita Nyong’o and Kelly Ripa, who were among the invitees at Priyanka’s bridal shower in New York, are on the wedding guest list. Elizabeth Chambers, who joined Priyanka in the latter’s bachelorette party, and her husband Armie Hammer will grace the wedding with their presence. The Duke and the Duchess of Sussex are among the crème de la crème on the guest list, but their attendance is unlikely. We’re wondering where Priyanka Chopra and Nick Jonas will be heading to for their honeymoon. Indian Eagle would like to book their flights from the USA to the honeymoon destination.